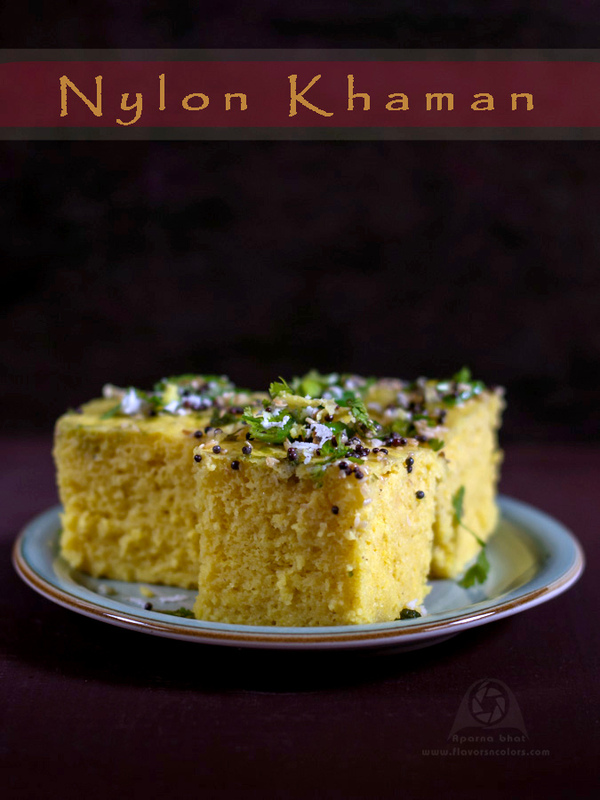 Nylon Khaman, a healthy delicious snack is very popular snack from Gujarat. It's super easy to prepare and can be whisked in a jiffy unlikely the traditional method which requires soaking and fermentation. I had tried making this dish several times in the past but somehow was never happy with the results. So when Reem Khan posted her recipe she had mentioned use of citric acid with a special note that "No, lemon won't do". As I read through her recipe I realized the reason behind my unsatisfactory Khaman was use of lemon juice. I followed her recipe with few changes and it turned out perfectly right ~ soft spongy and moist just like store bought. 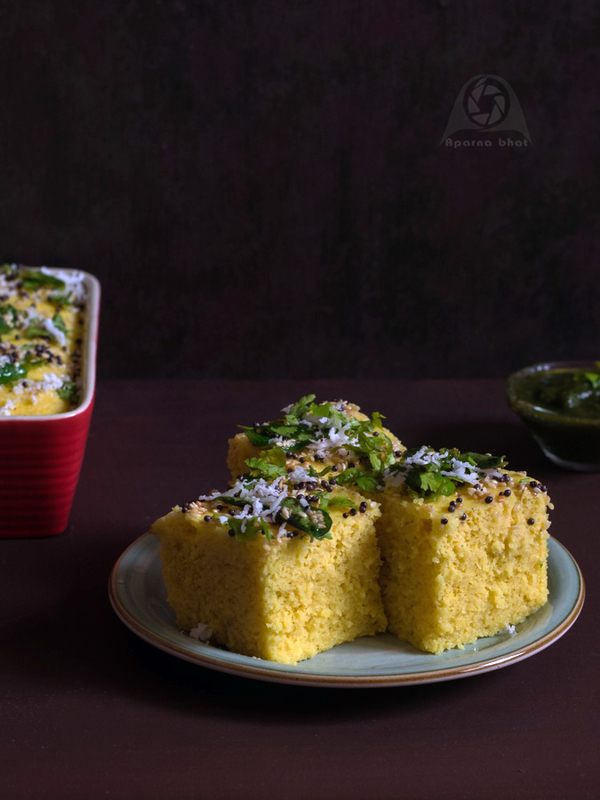 Now this is my no fail Khaman recipe whenever I plan to make them. 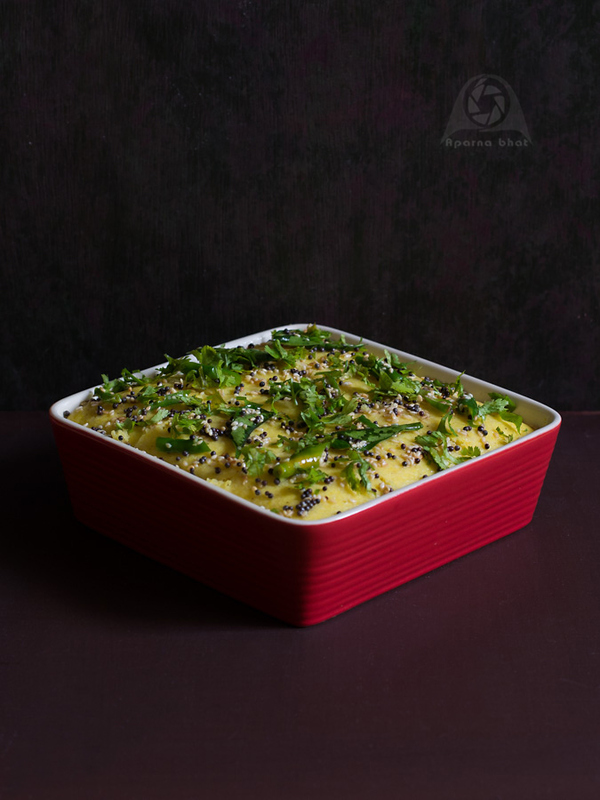 Dhokla plate or atleast 1 inch depth vessel. Wrap the steamer lid with a kitchen towel before you cover the steamer filled with enough water. Make sure to boil the water in steamer before you begin with batter preparation. Grease the plate/ vessel and keep it aside. In a mixing bowl, add all ingredients except water, oil and ENO. Mix it nicely. Add water gradually and whisk it well to avoid any lumps. Taste and adjust to get a nice sweet and sour taste. Add 1 tbsp oil and beat the batter to incorporate air into it. Add ENO to the prepared mixture and mix briskly to get a frothy batter that will double in size. Pour the batter in the greased plate/ vessel and keep it over a ring like stand inside the steamer. Steam it right away for about 15-20 mins. Supersoft Khaman is ready. Remove it from the steamer and allow it to cool for 5-10 mins. Meanwhile let's prepare the seasoning. Heat oil in small pan. Add mustard and allow it to splutter. Next add sesame seeds. Stir it for 30 seconds. Switch off the flame. Add hing and slit green chillies. Stir it and then add sugar, salt and water. Mix it well and heat it for half a minute. Pour half of the tadka on the steamed khaman and spread it evenly. Now with sharp knife make pieces and add the remaining tadka such that the solution seeps in through the cuts and sides. Carefully lift each piece and place it on serving plate. Garnish with finely chopped coriander leaves and grated coconut. Enjoy it with chutney or sauce.